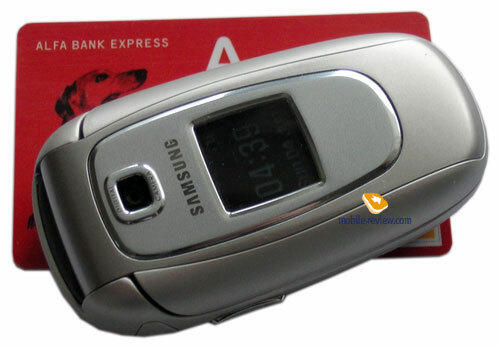 Samsung E330N is an update of Samsung E330. There are some changes in the model with an index "N", but they are not numerous. First of all the plastic, which the phone's body is made of, has changed, it became velvety and very pleasant to the touch. Due to the new plastic, the device will hardly slip down from hands. 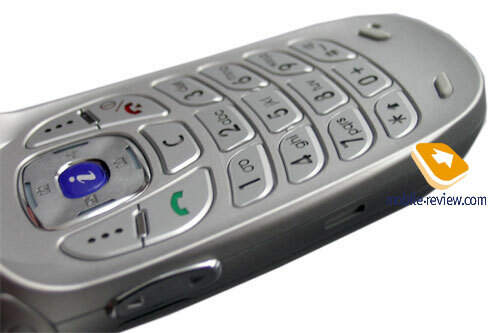 The second difference is the phone is a triple band: GSM 900/1800/1900. 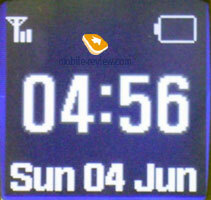 The third innovation is a replacement of the external color display to monochrome. And finally, Java MIDP 2.0 support appeared in the device. 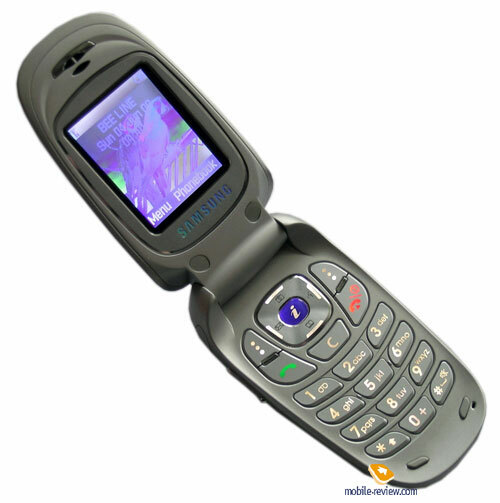 Like its predecessor, Samsung E330N is executed in the clamshell form-factor. 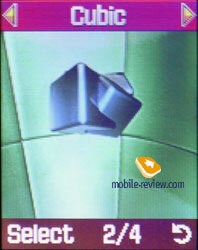 The device looks attractively, all edges are smoothed as much as possible, and it is pleasant to hold it in hands. Model's size has not changed in comparison with the predecessor (87.2x46.1x23.3), and the weight remained the same as well - 85 grams. The device is shipped in four colors: dark - silvery, bright - silvery, black and red. But in reality it is presented in shops only in the bright - silvery variant, probably, it is possible to expect other colors later. Quality of adjustment is very high; all details fit each other closely. The plastic, which the case is made of, is also quite good. On the left lateral surface of the device there is a socket for the headset's connection, equipped with a plastic cover, which is fixed on the case. A little bit below you will find a dual key of volume control. 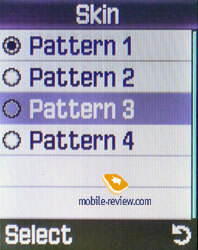 If you press it in a stand by mode when the phone is closed, you will activate the backlight of the external display. On the right lateral surface the button of camera's activation is located. At the top face there is an aperture for a strap, and on bottom face there is an interface socket with a plastic cover fixed on the case. 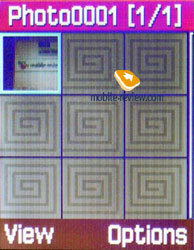 On the top cover of the device there is an objective of a built-in VGA-camera slightly sunk into the case in order to prevent scratches. 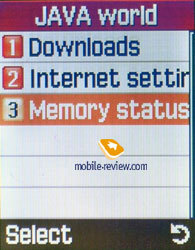 Here the external monochrome display with the resolution of 96x96 pixels (19х19 mm) is also located. The information on the screen is read well, there are no problems in the sun as well. Speaking about practicality, replacement of rather ordinary color display, which was in the E330 with a monochrome, is quite proved. 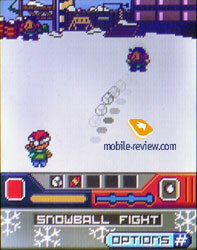 You may open the device without special efforts; this is promoted by the small deepening along the case. Having opened the device you will see a small internal UFB-display with the resolution of 128х160 pixels (21х33 mm) and capable to display up to 65K colors. 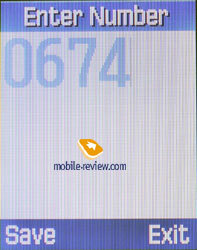 The quality of the display is average, picture does not look alive, and it has no enough brightness. However, it cause no problems in the sun, the information remains quite readable. 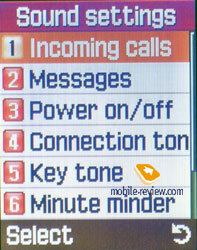 Localization of the keypad is standard for the majority of the company's devices. The four-positioning navigating key with button "ОК" in the center is of the average size and is quite convenient to work with. 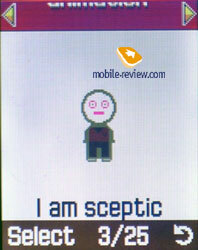 Digital keys are small but as far as they are well carried, erroneous pressing do not occur. The keypad is quite convenient even for people with large fingers. 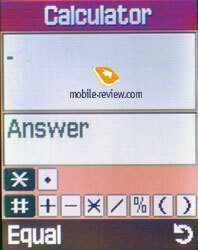 The backlight is of white color and it is spread well on all surface of the keypad. 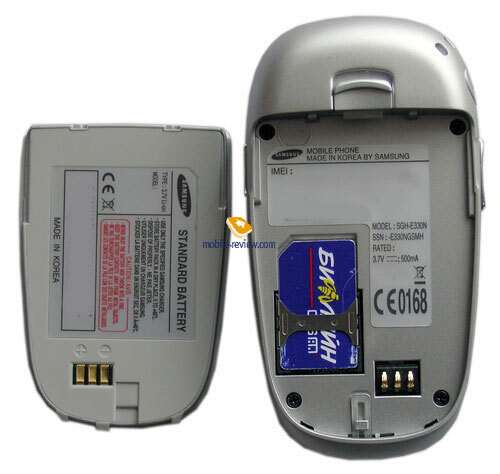 Practically all back part of the device is occupied by the Li-Ion battery, which has a capacity of 800 mAh. 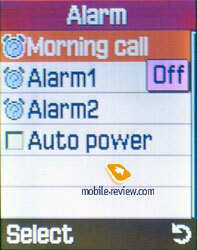 Under the conditions of Moscow MTS network, the device worked for about 2 days with 15-20 minutes of talks per day and about 20 minutes of other functions. Full charge of the battery takes about 2 hours. 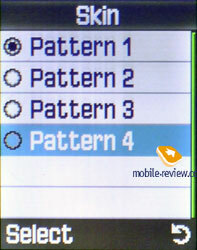 The main menu of the device is standard for last models by the company and represents a 3х3 matrix. A portrayal of menu's icons is good, icons are animated. 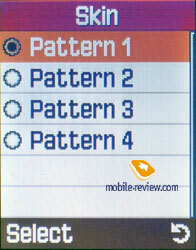 Submenus are presented as vertical lists. 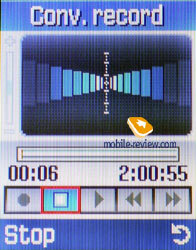 There is a fast navigation with the help of digital sequences. 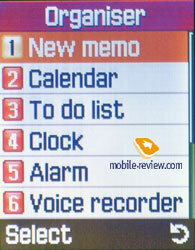 By pressing the navigating key in a stand by mode you will access following functions (it is impossible to change them): create new text message, camera, change a melody and calendar. In total, there are 6 Mb of the built-in memory dynamically distributed among all applications. Phonebook. 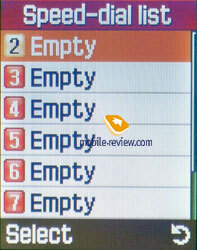 To get in it you should press the right soft key in a stand by mode, there is no special item "Phonebook" in the main menu. 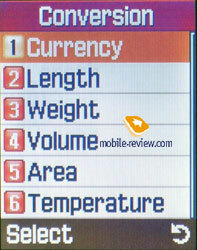 About 100 numbers can be stored in the device's memory. 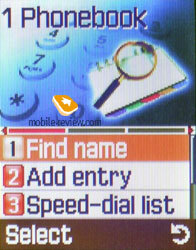 Each contact may be given up to 5 phone numbers, e-mail address (up to 50 symbols) and a small text note (up to 50 symbols). 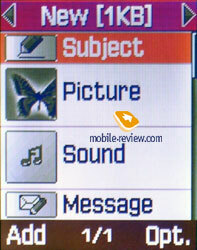 Besides this each contact may be associated with a picture or a photo, and also with a melody of a ring tone. 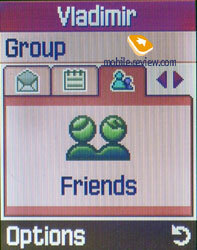 You may add a contact to one of ten callers group. 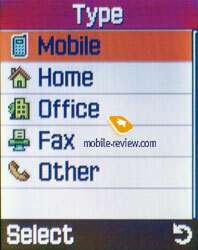 The information in the phonebook is displayed as bookmarks; transition is carried out by horizontal deviations of the navigating key. Search for contacts is performed letter by letter. 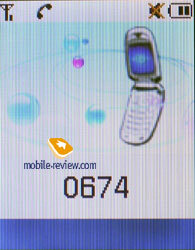 The information is displayed both from memory of the device, and from a SIM-card, there is a fast dial of 8 numbers. 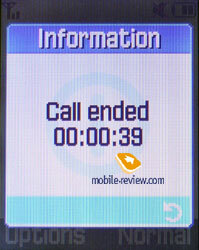 During an incoming call an appropriate photo is displayed only on the internal display, practically full screen. Messages. 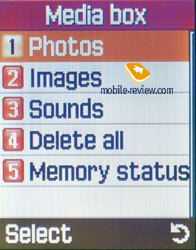 Up to 200 messages can be saved in the phone's memory. 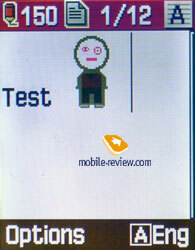 The device supports EMS standard; a set of small pictures (32), animations (25) and melodies (10) is already preinstalled. 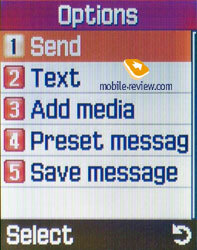 By pressing the right soft key "dо" when typing a message, you can change a mode and a language of the input. The device supports predicative input of text Т9. 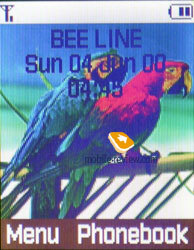 MMS editor is simple and clear; there are special pictures besides explaining inscriptions for the greater simplicity. 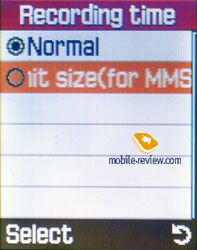 The maximal volume of the sent MMS can not exceed 95 Kb. 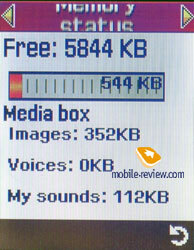 All free memory is available for storing messages. Call list. 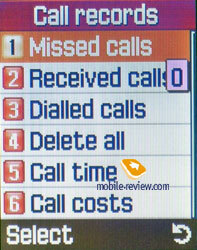 Standard lists (up to 20 numbers in each one) of incoming, dialed and missed calls. 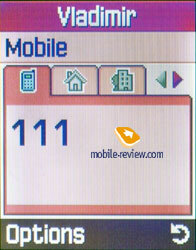 Calls from identical numbers are not summarized but are displayed separately. 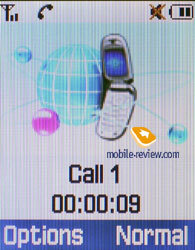 By pressing name or number you will see the phone number itself and the call's date and time. 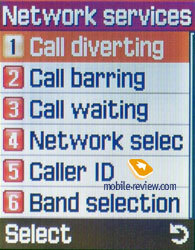 In the same section there are call counters. Sound settings. All settings connected with sound are collected here. 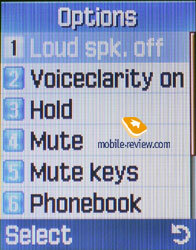 Unfortunately, there are no profiles in the phone; therefore it is necessary to make all adjustments through this menu. Organizer. 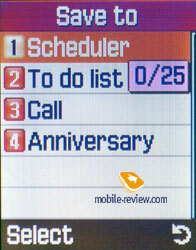 In the phone's memory it is possible to keep up to 100 events - 25 for each of four existing types - "meeting", "business", "anniversary", and "call". For each record you may set date and time, and a number for a call. In a calendar only monthly viewing is possible. 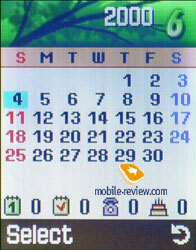 Those dates which have records are marked with color, and in the bottom part of the screen icons and indexes of events amount of each type are displayed. Alarm. 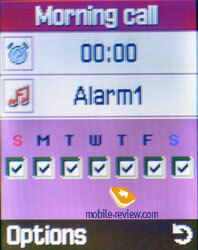 There are three alarms in the phone, each one available for setting its own melody and work days. 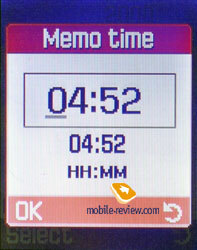 Dictaphone allows making records only in a standby mode. A record's duration is limited only by free memory. There is an opportunity to limit a record especially for MMS messages. 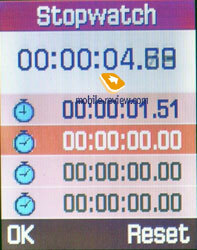 In the same menu there is a simple calculator, measures converter, stopwatch (up to 4 intermediate values) and countdown timer. Fun box. WWW Services. This section contains WAP-browser of version 2.0. Media Box. 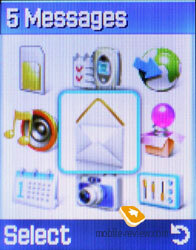 This section includes folders with photos, pictures and sounds. JAVA world. 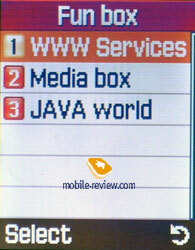 The device supports Java MIDP 2.0, 3072 Kb are allocated for applications. 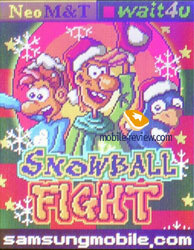 Two games are preinstalled: Snow Ball Fight and logic game Bubble Smile. Network. All settings connected with network are here. Settings. 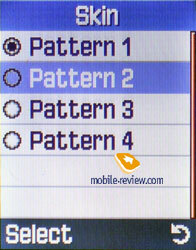 Here there are standard settings of the phone. We shall tell only about display settings. 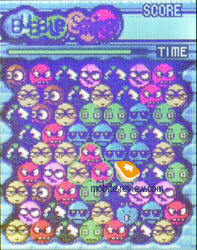 It is possible to set a wall-paper for the screen, which may be one of the 4 preinstalled animation pictures, photo or a simple static picture. You may choose one of 4 color schemes of the menu view. 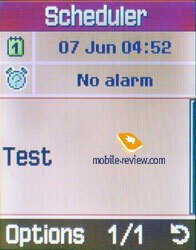 For the internal and external displays contrast settings are stipulated. 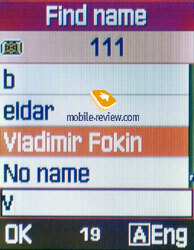 Here it is possible to choose color of figures while entering a phone number. Camera. 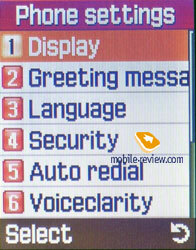 There is a built-in VGA-camera in the device. Both internal and external displays may act as a view-finder. Despite the external display is monochrome, it is quite good for shooting a self-portrait. 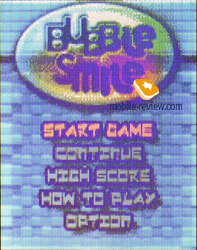 The camera can take pictures of the following resolutions: 640x480, 320x240, 160x120 and 128x120 pixels. Besides it is possible to expose compression quality: super fine, fine, normal, economy. While shooting, it is possible to impose one of 15 frames or to take advantage of one of 5 effects. The camera's quality is average; more or less good pictures can be received only at good illumination, otherwise it is rather difficult to determine what the photo represents. 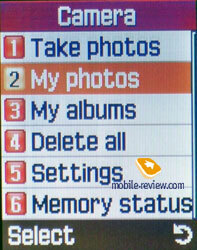 While IrDA is absent pictures cannot be transferred to the personal computer, viewing is limited only by the phone's screen. 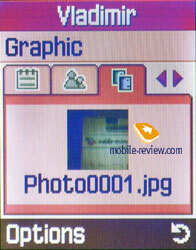 In a picture album you can view pictures both as thumbnails (9 pictures are displayed simultaneously) and one by one in a full screen mode. 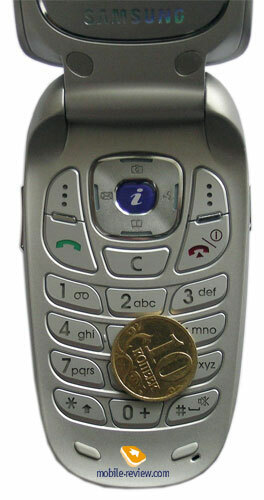 The device provides average connection quality, it loses network instantly in places with uncertain reception. Dynamics volume and sensitivity of a microphone are average too. Sounding of 30- polyphony ring is good; mmf melodies may be set as a ringtone. 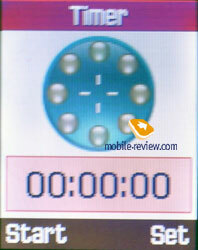 Ring volume is higher than average, vibrating alert is rather powerful. 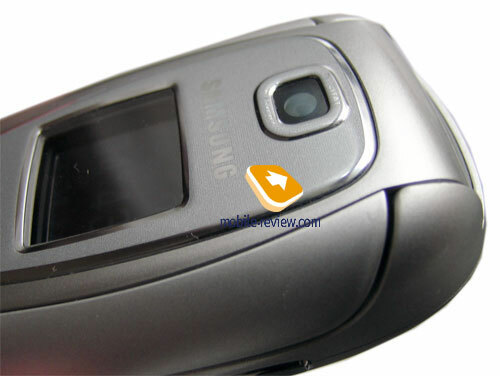 Samsung E330N is interesting due to its design and body material. 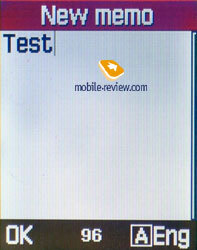 The external monochrome display is more likely a plus than a minus. 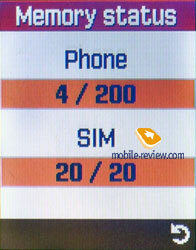 And the presence of the built-in VGA-camera of rather poor quality only increases the phone's price. Average connection quality has also afflicted. First of all the model will suit undemanding users who are interested in the phone with attractive design in the clamshell form-factor. The only thing that can disturb is the phone is overpriced (it is about 190 US dollars). In this price range the model has many more functional competitors.